I tell ya! I get tunnel vision when it comes to quilting and scraps! This isn't the first time, nor will it be the last...that I'm sure of! Here's the deal. 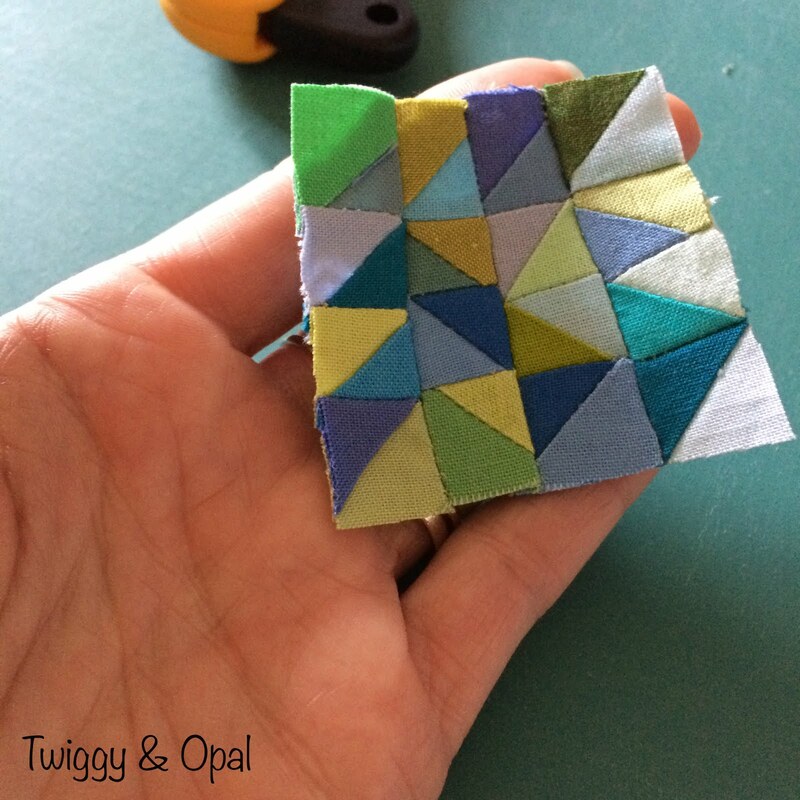 I was working on a quilt made of Half Square Triangles. I pieced that top together, but had a good stack of extra blocks left over. Of course those were going to be used. I went from a big quilt to a baby quilt in one seamless transition. For the smaller one I had to trim the HST's an inch smaller, which left me with a pile of scraps. At first I threw them in the trash...and then I didn't. Yes, I did go through the trash and pull them out. So much for vowing not to hold on to tiny pieces! It's a sickness! I saw these corner pieces while I was trimming and for some reason I thought why not stitch them together and make a mini mini quilt. It was a bit stupid and I wanted to do it for no other reason than...they were there. And so I did. Cute, scrappy and oh so not perfect! But I did it and had to finish it...because that's what we do as quilters. I opted for just over 1/8" seams because it isn't like this is going to be draped over someones lap! The HST's finished at about 1/2" in the end. I grabbed the trimmed strips from the baby quilt and figured if I just 'log cabin' it around the center for a few rows it could be done. My addiction would be fed, my scrap happy heart would be satisfied. The more rows I added, the more excited I became. Where a few rounds was my goal, it eventually changed to 'once it's big enough where my scrap strips can't make it around the sides' ... I'll stop. It continued to grow by adding seven rounds of 1/4" (finished) strips. So, let's add a border and call it good!! ...which led to 1/2" Logs, which led to another border...which led to 3/4" logs. You get the idea! It just got away from me! I did not intend for this to happen. And secretly...I was loving it though! As much as I wanted to keep going round and round, I had to put an end to the madness. If I took it further what would be the point of the center? It would be lost and mean nothing. I stopped. My 'crazy' was fed and I was full. It ended up being a just over 22" x 22". Much bigger than that little center square and way bigger than I ever intended it to be! Next up is quilting. I grabbed a few thread options and decided I'll use all three! Aurifil #1231 Spring Green, #1148 Light Jade and #2730 Delft Blue. How I'll quilt it is up for debate, but I've fit it in with my stack of 'to be quilted' quilts and hope to share it soon! That mini-mini turned mini is beautiful. Love the colors. Secretly I love when a project takes over and I just go with it! It was just plain and simply so much fun…I couldn’t stop! Oh my I love it, that mini little quilt turned out into a beauty!! Imperfectly perfect! A beautiful mini! love love love! so glad you fed your crazy and went with it. 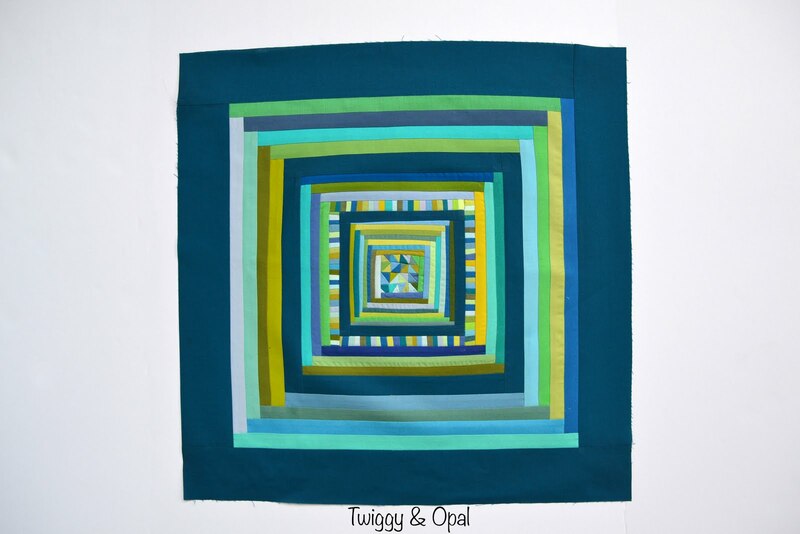 I can just feeel how much fun you had with this one...and it is gorgeous....I so love blues and greens! Those teeny-tiny HSTs are amazing! 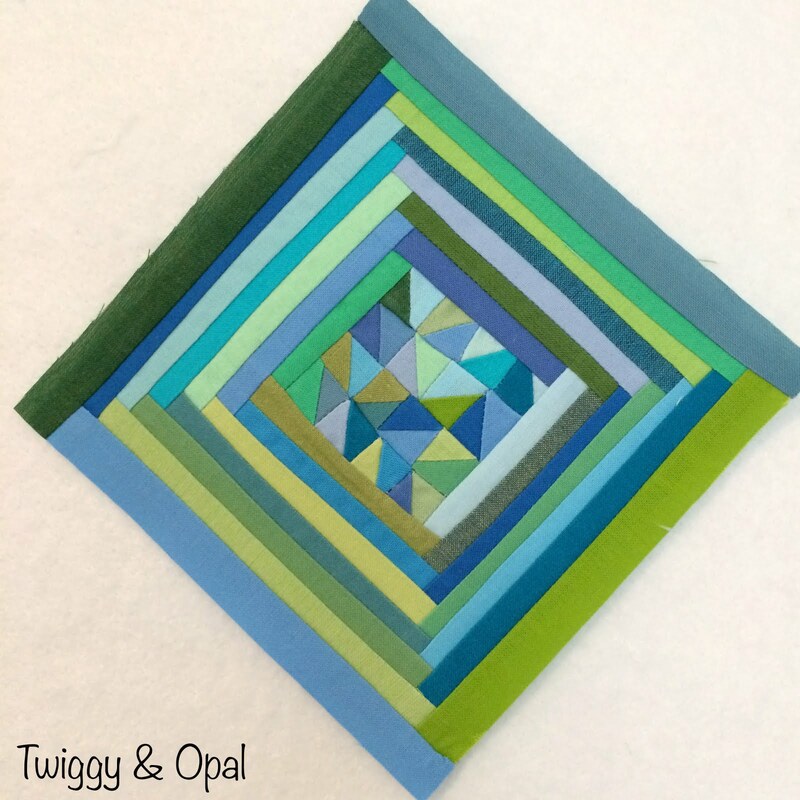 It's so fun to see what you do with the scraps other people would throw away :) The mini quilt turned out to be the perfect use of those little bits. Every year I vow not to save smaller scraps and every year I fail at it! 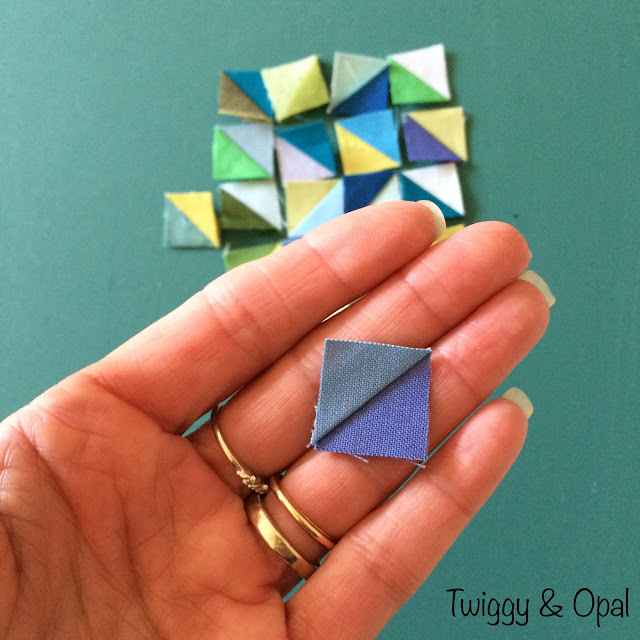 If a scrap of fabric inspires me…who am I to argue?! I'm glad you kept going! 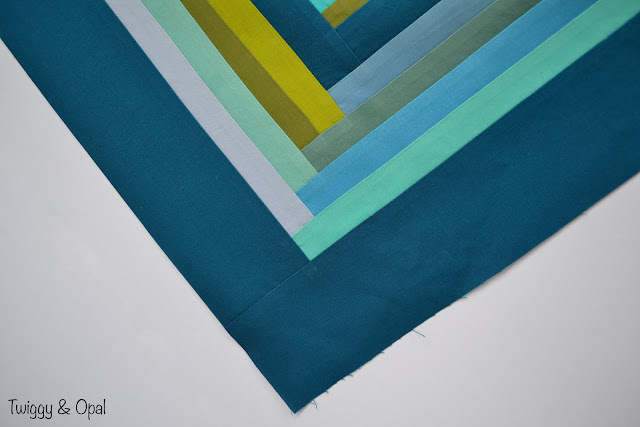 The tiny piano key border was a stroke of genius, and the strips create such a pleasing frame. Half of design is knowing when to stop, I think, and you found the perfect spot! I am so in love with your scrap creations. There is no way I would have saved those tiny HST, but you turned them into something completely spectacular, I love it! I love this ... It should be named "scrap mini" .... so cute and fun!! Ha! Ha! Now THAT was entertaining! Very fun to see that creation be born. Another beautiful work by Jayne! Can't wait to see how you decide to quilt this. You just crack me up girl!! You are a little bit crazy(in a good way)Jane:0 It's always so fun to see what you come up with out of your dumpster diving, hehe. Love that little striped detail. There takes a bit of crazy to get started on a project like this. And then when it’s finished I become a genius! LOL! 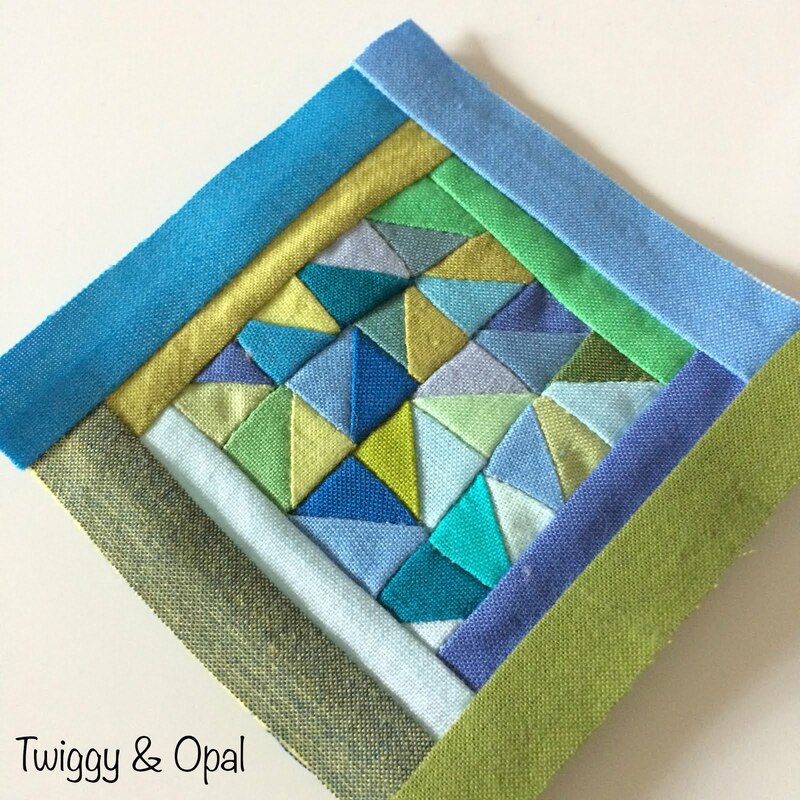 You gotta love quilting! 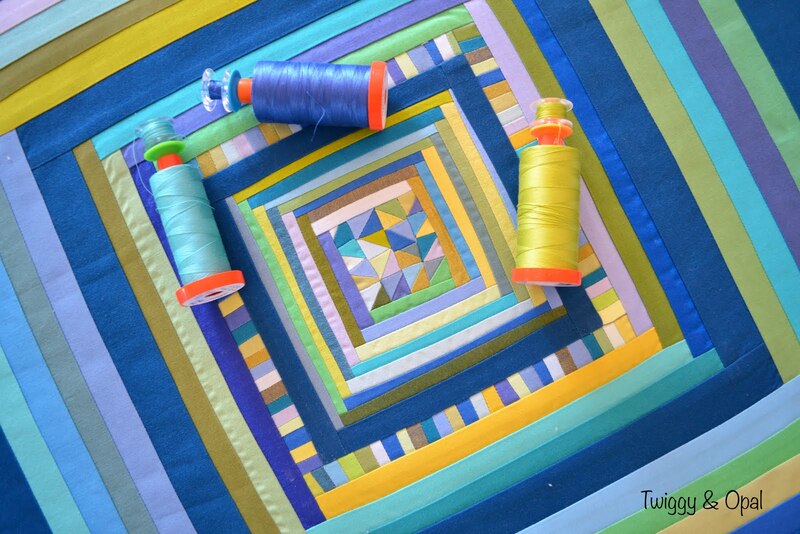 I think you are going to be like Alice in Wonderland and disappear into a vortex of teeny tiny quilt hst! As soon as I saw your project I thought “doll quilt”. I had just on Needle and Foot about the amazing Doll Like Me project. Check it out!! I have a good-sized box of bonus hst’s from years of projects. I hope to find some time this year to play with these!! I think my smallest ones are 1 1/2”. Wonder where they will take me?! It's lovely! Have you named this piece yet? Because if not, might I suggest calling it "Serendipity?" This is the kind of madness that is just plain AWESOME. :) Thanks for sharing its journey with us! Your post made me smile. I love it when something grabs you like that and you can't stop. And look at the wonderful end result. There are other addictions that have much worse results. I think you are safe with this one. Honestly, I wouldn't have kept those tiny bits, but I DO love where you've taken them!! Wow! You do amazing stuff with tiny! So many tiny little bits. Isn't it funny when our scraps scream out from the trash can to be saved. So glad that you did. You are such an inspiration to those of us who love tiny bits and mini quilts! I love what you did with this one - and I especially love the different colors of thread you're planning to use. Fun! I have often thought I needed a cover on my trash bin. I too get tempted by bits I have tossed. But never anything this small! But your quilt is amazing so it is a good thing you rescued those bits. Thanks for sharing with Oh Scrap! It is a sickness, but a wonderful one. I love where those little bits took you. I started the year with great plans to reduce my scraps. But I think they just multiply in other ways. The more you use them, the more there are. They’re just smaller. You have just proven that to the ultimate degree! 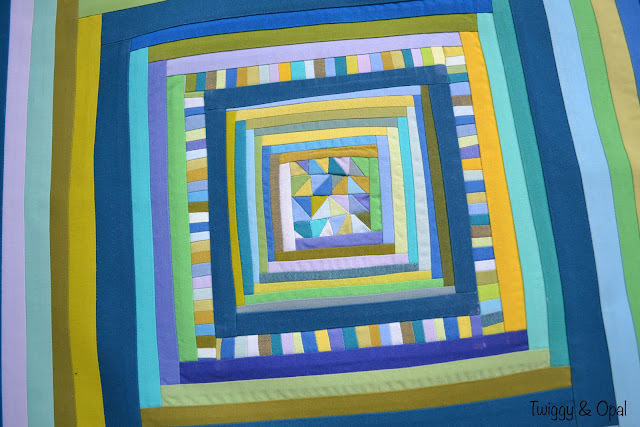 This little quilt is such a delight, and I know you will quilt it wonderously.